Note: This version is for Orchestra. There is also a short version for piano solo that includes five of the ten dances – Israeli Country Dances, Suite for Piano, Op. 230p. The suite Israeli Country Dances presents 10 images of the atmosphere of the new state of Israel in the mid 20th century. Composer Marc Lavry makes an original indirect use of dance to describe the way of life and landscapes. Opening: An exposition depicting Israeli landscapes through Lavry’s typical orchestration. Part I – Procession: A majestic march at a 2/2 rhythm. Part II – Mountain Folk: A breezy, rhythmic and quick dance. Part III – The Amorous Shepherd: A macho and clunky movement with a touch of grace. Part IV – The Shepherdess: A song of the gentle and shy timid mountain girl. Part V – Polka: An Israeli and humorous interpretation of the European dance. Part VI – Peasant’s Dance: a primitive, authentic and happy sway. Part VII – In the Valley: A description of the pastoral sloping landscapes of the Jezreel Valley at dusk. Lavry incorporated in the melody echoes that generate a sensation as if the orchestra is physically in the valley. Part VIII – Debka: A Bedouin dance of an increasing and exhilarating pace. Unison octaves and pizzicati exude a Middle-Eastern atmosphere. Part IX – Hora Finale: The typical Israeli dance opens with a clarinet solo, joined by the rest of the orchestra, to a grandiose ending. Lavry was the first to introduce the Israeli Hora dance into concert music. 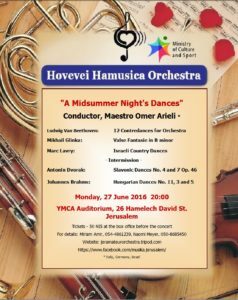 The Hovevei Hamusica Orchestra will be performing Marc Lavry’s Israeli Country Dances, Suite for Orchestra, Op. 230, as part of the “Midsummer Night’s Dances” program. 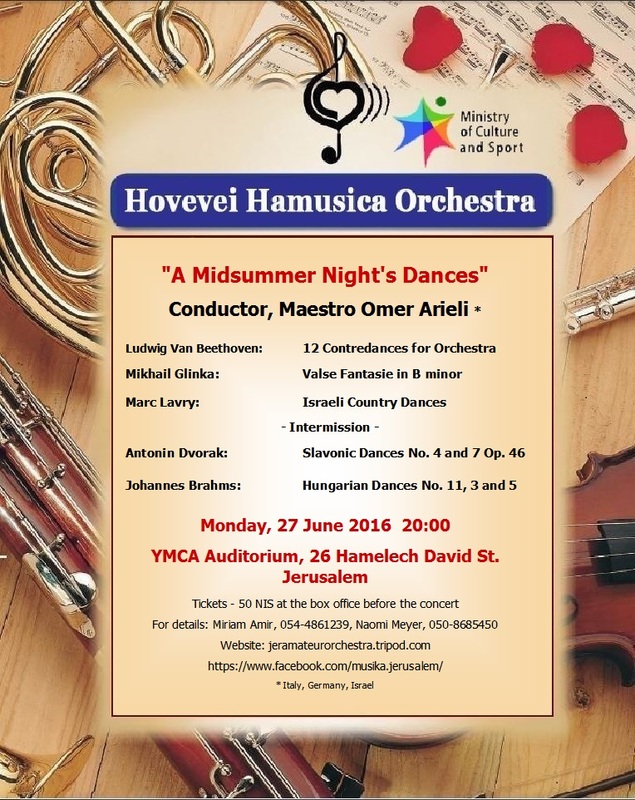 Where: YMCA Auditorium, 26 Hamelech David St., Jerusalem. When: Monday, June 27, 2016 at 8:00PM. The Los Angeles Jewish Symphony performed Marc Lavry’s Israeli Country Dances, Suite for Orchestra, Op. 230 as part of their Cultural Collaborations series. Lavry’s composition was interpreted by BodyTraffic, a contemporary dance group. The performance was on Sunday, August 25, 2013 at 7:30PM, at the Ford Theatre, 2580 Cahuenga Blvd, East, Hollywood, CA 90068.